I have been traveling to Peru for the last 14 years. Each year I always visit Saqsaywaman with its ancient Lumerian stone walls. 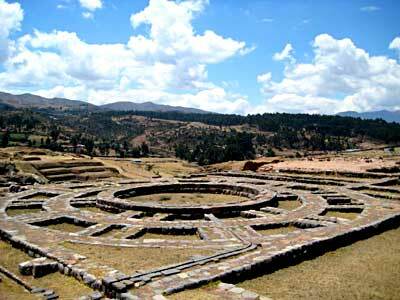 Saqsaywaman is located just north the naval of the earth which is Cusco, Peru. There is no other sacred site quite like Saqsaywaman; nor walls that are so unbelievably massive. 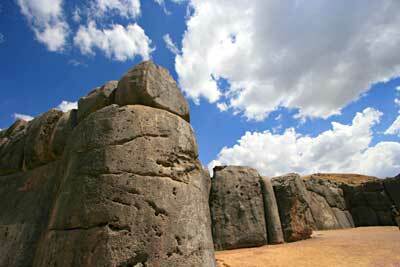 Saqsaywaman is the head and jagged teeth of a huge Puma shaped landscape of which the ancient city of Cuzco is the body. There are three ascending zigzaged walls at different levels made with enormous carved limestone boulders. The boulders used for the lower levels are the biggest. One is 28 feet high and weighs about 140 tons. This site is classified as being from the cyclopean or megalithic eras. The stones fit so perfectly together that a knife blade can't slide between them even today. No mortar was used and the whole architectural structure of the site would classify as a stonemasons nightmare. In spite of all the massive grandeur, there was no art transcription used which makes the entire site quite a mysterious enigma. Saqsaywaman leads us to dream about why it was built, and humbles us by the fact that we could not duplicate the structure today. The local Quechua people say that the three ascending walls represent the three levels of Andean Cosmology. Uku Pacha (underground / snake), the Kay Pacha (earth / cougar or mountain lion) and the Hanan Pacha (sky / andean condor). At the very top level of Saqsaywaman, the sky/condor level, is a huge stone-spoked, medicine wheel. Some suggest that the zigzag shape of the teeth of the Puma also represents a lightening bolt, and to be "touched" by lightning was considered a gift of great awakening. Every year I visit this massive site, and every year I leave still scratching my head wondering why it was there, what it meant, and perplexed at the silence of the ancient ones regarding this matter. I had given up on understanding Saqsaywaman this year. I decided just to absorb it, and quit trying to understand it. Little did I know that the message, which I received in the Phoenix airport, from a group of beings called the "First People", was connected to this site. As I sat to begin to simply feel the site, I saw the continuation of a vision that had begun many years prior. In this vision, I was able to see an unusual 3D grid that seemed to bridge from the teeth in the wall to the other side of a natural rock formation. This high-tech looking grid seemed foreign to planet Earth. I have seen a similar one in the Site of Avebury in England. At the time, I didn't understand it, so I just let go of it, and put it in one of those places I call . . . Gee I wonder what that is? Then I started to hear them again, the "First People", the original ones, the ones that started talking to me while I was in the Phoenix airport. I know that what I share here with you will fall way short of what I saw in the vision. But I am going to give it a try, because I know that this vision triggered what was to evolve through the entire trip, and I am hoping that it triggers something in you just as beautiful. The original ones told me . . . they came to Earth a long time ago. This was a time when any life had yet to appear. Earth was just a silent sphere in the universe. There were no plants, no animals, nor human beings. They arrived here to begin to seed the Earth with energy that would support plant and animal life in preparation for the arrival of humanity. Because they were foreign to the energies of Earth, they had to build an artificial looking, high-tech, grid system in which to exist. This grid was used for the original ones to integrate and bond with the Earth energies and live on the Earth for a time. There were many other sites around the planet that were doing the very same thing; but most evidence of these are gone now. One of the problems with their work is that they anchored the energy of the vision on the planet artificially. The reason they broke their silence and began sharing this message is because the time has come for humanity to bring to life the 13th code on the Earth. But this time, humanity is to do it naturally; not artificially. It is our job to bring this vision of paradise back to Earth. As they faded and I tired, they reminded us to keep our hearts open so that we can receive messages from the original people. We said we would. 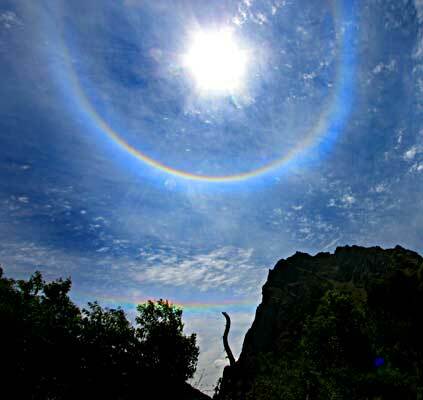 (Read about sun dogs and Ollantaytambo here http://www.alunajoy.com/2008oct.html ) . It wasn't until we reached the traditional village of Ollantaytambo that I heard from the First People again. When we arrived, a huge SUN DOG appeared very low in the sky and pointed to my favorite spot in the site . . . the condor rock. I think I could rate Ollantaytambo as my favorite site in Peru. I also would like to say here that we bring you this message because of my partner, Raphael, who recorded and transcribed this message. He knows I forget them immediately after receiving them. This message was not only for our group. We were all quite aware that this message was for all like-minded people across the planet. The First People began . . . the Sun Dog in the sky is evidence that it is starting. It is starting in us, because our hearts are open to this. Our hearts are open to bringing harmony and paradise back to Earth. So it is starting in us, and it will be our job to bring this rainbow, the rainbow heart energy back to the world that we return to when we are finished with this journey. But for now, we want you to just allow the rainbow into your heart, (readers can do this by meditating on the photo of this Sun Dog above) and know that all colors are represented in the rainbow even though you may not be able to see them with your eyes. It is all present, and is all ONE beautiful harmonious circle over our heads. The colors represent the diversity in humanity and the circle represents the harmony and a coming together of this diversity. They continue . . . there are other places on the Earth right now, in other sacred places, where Sun Dogs are appearing. Ask your family in other places around the world if they saw Sun Dogs around the Equinox this year. Also, share this story with others so that they will renew their hope and faith that harmony is returning. The evidence is being written in the sky. It is being written in the sky, and written in Spirit right now. This is the first step to manifest harmony into the physical world and our physical reality. This is the beginning to bring back the harmony that we have all been searching for so long. This energy is coming from the source that all that is. But also there is a considerable amount of Pleiadian energy in the Sun Dog today. We appreciate that you recognize the blessing in this . . . most people walking in this site won't even notice. But you did, and because you did, your hearts are open to letting it flood your hearts with this rainbow energy that is very magnetic, very energetic, and is transmitted at an extremely high frequency. (Aluna fills in with a bit of history): The Star Elders said several years ago that enough people of light were working to actually push the envelope by 4 years for a prophecy that they had calculated almost 10,000 years ago. They had calculated that humanity would have our grand awakening in 2012; but several years back they said 2008 was the big date. We are only a few months away from completing that year. They say that we will see big shifts in the collective consciousness by year's end. We have been seeing shifts in the Earth, and in sacred sites all around the world that are opening. Shifts in energy always open in sacred sites first, and then that energy floods across the planet. So we are experiencing the first rays of Paradise, with this incredible Sun dog, and this will wash across the planet in the next couple of months. We have had the blessing of being the first to see the sun rise in paradise. So we want to take a moment and thank the Great Source that all that is for allowing us and trusting us with this beautiful energy that is flooding the planet. It is a great honor to be in this sacred land experiencing this beautiful energy. It is something that I have not seen in 14 years that I have been coming here. So this is really special. The original ones continue . . . The Source that all that IS feels appreciation for each one in this circle, and for each one across the planet that recognizes this moment. The sites are coming alive. They are absorbing this energy . . . the faces in the mountains, the condor, all up and down the sacred valley, all the way to Machu Picchu, all the way back to Cusco. This energy is flooding in here now and in other sacred places across the planet. So there are many people traveling at Equinox right now. So they are also feeling this. The mountains will come alive. The plants will come alive in a way that we will recognize way beyond what we have experienced before. We will understand that all life is not separate from each other. We won't see the difference between ourselves and the tree that we are standing next to, or the rock that we are standing next to, or the Earth that we are standing on. We are going to recognize that they are just as alive as we are right now. We are going to see the aliveness of everything being just as alive as we feel right now in our own bodies. It is going to feel that alive. It is the Paradise that we have forgotten . . . Where we recognize that everything in creation is just as alive as we are, and we won't feel separate from it anymore. (Aluna fills in again . . .) I want to acknowledge the presence of Lord Meru and the Brotherhood of the 7 Rays. I am feeling them real strong. But the most prevalent one is the "Source of all that is". It is huge. There are no words for how huge it is. It is the presence of God. The light of God is finally busting through the illusions of our world to bring us back into harmony, and bring back life in a way that those places inside of us, that feel empty, will be fulfilled again. The First People continue again . . . this beginning is because of you. Because of your positive energy, you have created this shift toward harmony. Other heart centered groups around the world have created this also. You have done this together, even if you don't recognize this in this moment. You are not as separate as you think you are. Frequency is the only thing that separates you. Like frequency works with like frequency. You have created openings, breaches in the illusion that this world has around it. Groups all around the world are doing this right now including you. You have created pinholes in the illusion where the light of God can shine through to awaken humanity and awaken the Earth. You have been thinking that you were the ones that need to awaken, but you can feel the rocks are soaking in this energy and the mountains around you are soaking in the energy, and they are all becoming more and more alive. So it wasn't just us that you that was asleep. The Earth and all of life were under this cloud of illusion. You are all moving into paradise together as one. This is happening because of your awakening and positive consciousness. Every single one in this circle was never originally from the Earth. You are all from the Stars. You have learned, worked, suffered, sacrificed, trusted and never gave up to busting open those little holes in the illusion around this Earth. You did this so you could bring the light back to the Earth again. (Aluna shares her gratefulness for the message here . . .) We thank Lord Meru and the Brotherhood of the 7 Rays, the sky above, the Earth under our feet, the mountains around us, and all the beings that have come with us on this journey, because this is a very big group. It is much bigger than 33 people. We all know that. We are surrounded by angels and Masters. The only thing that I ask for myself and for everyone in this group is that we stretch even further, and our hearts stretch, and we ask the Lemurian healers that said that they would be with us, to stretch our hearts even further so that we can grasp and understand and feel the magnitude of this day. And so it is. (PS… The Lemurian Healers are a group of four human like beings that I connected with in 1996, while meditating on the Island of the Moon in Lake Titicaca. They were inside the Crystal City inside the Lake. Once in a while they show up in our groups to help stretch our heart centers (Readers . . . you can call on them and ask them to do the same for you if you have a calling to do so). Also, while I was receiving this message for our group, our new Ollantaytambo Sun Dog Essence was being made, under this powerful Sun Dog, atop the amazing singing rock under the condor's wing. The messages built upon one another while we were traveling in Peru. We will be sending you more as soon as I am able to pull it together. And thank you again Raphael for recording and transcribing this message. You make it possible for us to share the message received with a broader group than just our humble little group. Aluna Joy Yaxkin - www.AlunaJoy.com © 1995-2013 - Unauthorized use and/or duplication of any material on our web site without express and written permission from its author and/or owner is strictly prohibited. Violators will be reported to the DMCA. Please respect our work, that we intend to continue to offer to you freely.